You don't need to care whether you are using a Snom, Cisco, Sipura, Aastra, Polycom, Tiptel or Siemens phone or whether it's using FXO, ISDN, SIP oder SCCP.CallControl works with almost every phone, as long as you or your provider is using an Asterisk PBX. Know who's calling you. CallControl can match the incoming call right to an AddressBook record regardless of where it is saved: Local, iCloud, Exchange, AddressBook Server or LDAP. You'll also see a picture of the person calling you. Call everybody - they are just a fingertip away. You may dial you numbers right from CallControl and don't need you phone to type in a number. That makes calling out much easier especially if you are working in a mid to high-traffic environment. Your team is always there, even if you don't see them. You can add team members to CallControl which sets team features active. You can always see your team members call-state, pick-up (steal) calls or transfer every call directly to their desk using CallControl. You need to know about missed calls and want to have a history of your dialed numbers? No problem. That's included in CallControl. In the History you have a list of every call with an icon showing you the type of call. For documentation purposes you can also see the duration of every call on your phone. You missed a call? No problem. Just double-click and you get back to everyone within seconds. Everybody saves their numbers differently in AddressBook and numbering plans differ worldwide. CallControl knows most numbering plans worldwide and can recognize how you saved your number and prefix it with the right digits, if it's not in the correct format for direct dialing on the phone. 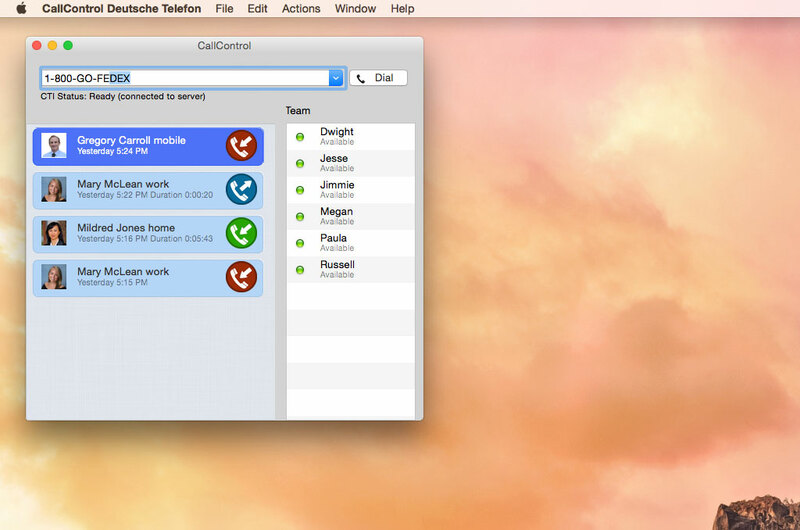 The first version of CallControl was released in 2008 and featured “CTI for Mac with Asterisk 1.4″. Since then CallControl got some major overhauls and now works with every Asterisk version since 1.4. 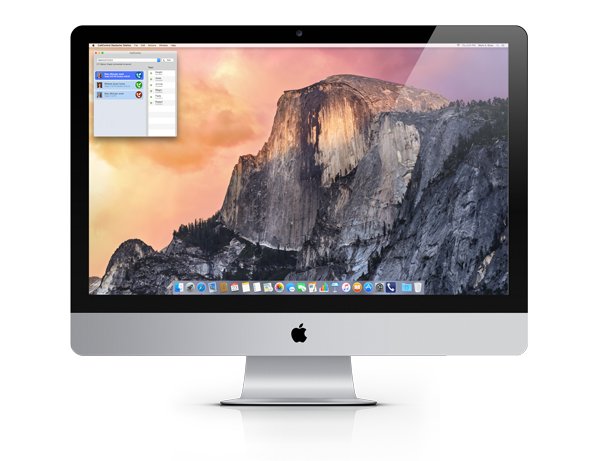 Centrex and VoIP providers worldwide offer CallControl to their customers as their first choice CTI application for MacOS X. You can testdrive CallControl for 30 days for free. After this period of time you can choose, whether you want to keep on using CallControl. All important CTI (Computer Telephony Integration) functions right at your fingertip. Dial numbers from your Mac and monitor your call history. Any missed calls? Call them back by double-clicking. 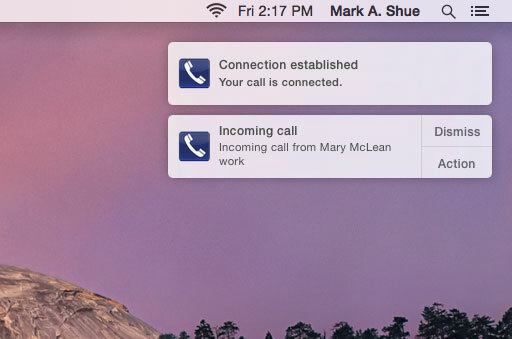 CallControl uses the builtin Notification center of your Mac to let you unobtrusively know about incoming calls, while you are working in other apps. The customizable "Action" button allows you to open an external database, website or CRM and transfer the number of the incoming call directly into the third party system. 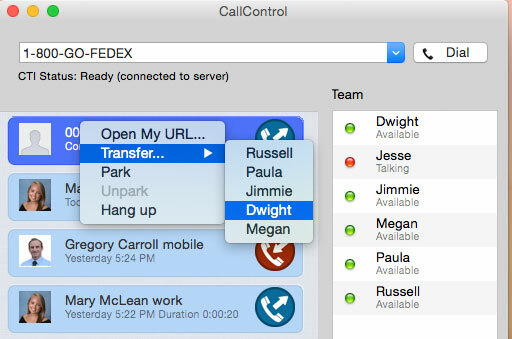 CallControl monitors the extensions of your team members. You may pickup incoming calls from them or transfer your calls over to their desk. 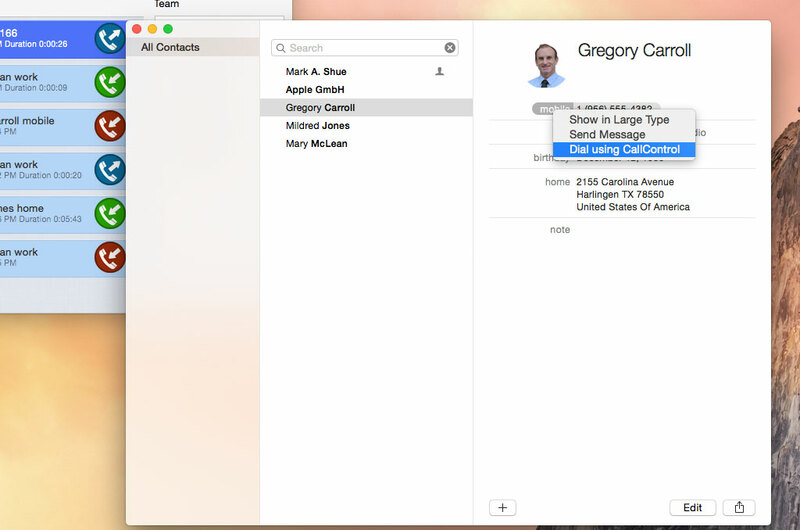 After using CallControl for the first time you can start dialing from the Contacts (AdressBook) app on your Mac. Just click on the number and choose "Dial using CallControl". CallControl works with AppleScript. You can use AppleScript for many custom behavior on your Mac. Just add dialing from CallControl to your workflows. CallControl registers several URL schemes. 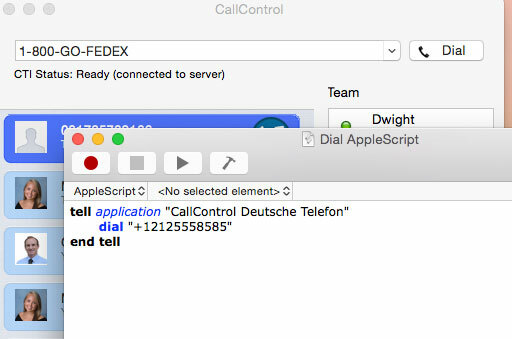 You can just create a link with the prefix tel: or callto: or dialcallcontrol: - Your Mac will know you want to dial a phone number and message CallControl to dial the number for you. 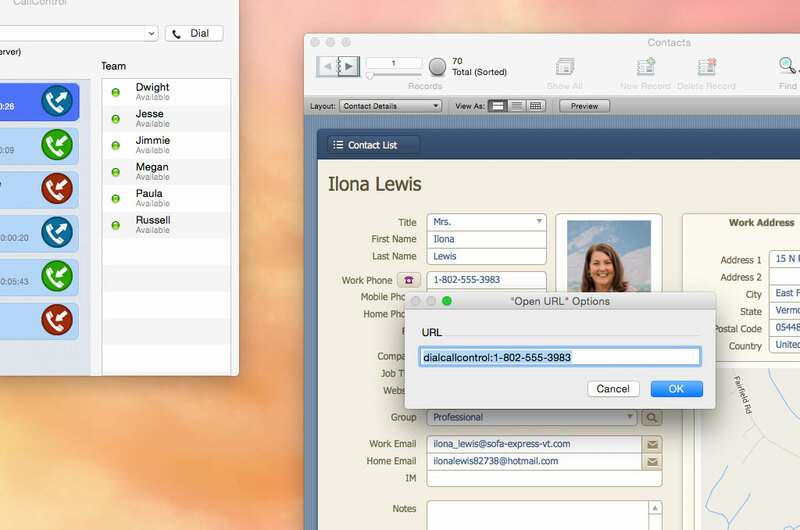 That also allows you to dial phone numbers from your custom FileMaker Pro solutions. You have questions, need help installing, found a bug or need a quote for a larger installation of CallControl? Just fill out the form and we will get back to you! If you are a Centrex or VoIP provider and want to license CallControl for your customers we are happy to help you out.